The United States faces no greater challenge today than successfully fulfilling its new ambition of helping bring about a democratic transformation of the Middle East. 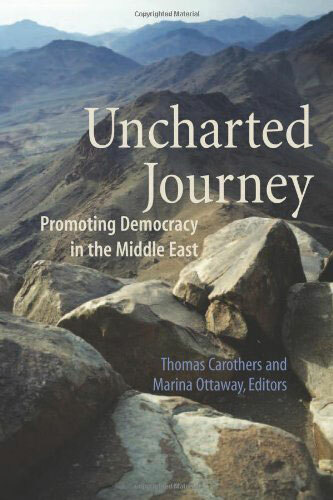 Uncharted Journey contributes a wealth of concise, illuminating insights on this subject, drawing on the contributors’ deep knowledge of Arab politics and their experience with democracy-building in other parts of the world. The United States faces no greater challenge today than successfully fulfilling its new ambition of helping bring about a democratic transformation of the Middle East. Uncharted Journey contributes a wealth of concise, illuminating insights on this subject, drawing on the contributors’ deep knowledge of Arab politics and their substantial experience with democracy-building in other parts of the world. The essays in Part One vividly dissect the state of Arab politics today, including an up-to-date examination of the political shock wave in the region produced by the invasion of Iraq. Part Two and Three set out a provocative exploration of the possible elements of a democracy promotion strategy for the region. The contributors identify potential false steps and a productive way forward, avoiding the twin shoals of either reflexive pessimism in the face of the daunting obstacles to Arab democratization or an unrealistic optimism that fails to take into account the region’s political complexities. Eva Bellin (Hunter College), Daniel Brumberg (Carnegie Endowment), Thomas Carothers (Carnegie Endowment), Michele Dunne (Georgetown University), Graham Fuller, Amy Hawthorne (Carnegie Endowment), Marina Ottaway (Carnegie Endowment), and Richard Youngs (Foreign Policy Centre). Thomas Carothers is director of the Democracy and Rule of Law Project at the Carnegie Endowment for International Peace. His other books include Critical Mission: Essays on Democracy Promotion , Aiding Democracy Abroad: The Learning Curve , Funding Virtue: Civil Society Aid and Democracy Promotion, edited with Marina S. Ottaway, and Assessing Democracy Assistance: The Case of Romania. Marina Ottaway is senior associate in the Democracy and Rule of Law Project at the Carnegie Endowment. She is the coauthor of Democratic Mirage in the Middle East (Carnegie Endowment Policy Brief No. 20), the coeditor of Funding Virtue: Civil Society Aid and Democracy Promotion, and the author of Africa's New Leaders: Democracy or State Reconstruction?. "Since the invasion of Iraq, promoting democracy in the Middle East has become a central issue in American foreign policy and an intensely politicized one. Uncharted Journey is therefore an extremely timely and important volume—a dispassionate, incisive, and practical analysis of the opportunities and pitfalls of Western democracy promotion in this critical region. Highly recommended to policy makers and scholars, as well as to all concerned with the political future of the Middle East." "This excellent, much-needed book is packed with critical insights for the development of effective democracy promotion policies and programs in the Middle East. It also provides refreshing, innovative ideas about possible routes to Arab democracy and the new realities of regional attitudes toward political change." "A must-read for policymakers pondering whether and how America should try to promote democracy in the Middle East…a valuable contribution to a burgeoning field where serious studies on the implications of reform based on lessons learned from other experiments in democracy building are sadly lacking."